The late Tony Irvine was well known to the botanical community in the Atherton and Cairns area because of his work as a rainforest ecologist at CSIRO, Atherton and his passion for conservation. He was active in a number of “green” endeavours such as reforestation and reclamation of “fallow” lands. In fact, he and his wife, Helen, bought a large parcel of cleared grassland just outside Atherton in the 1980’s and planted it with local rainforest trees and exotic fruit trees. Today it stands as his monument to a cause. 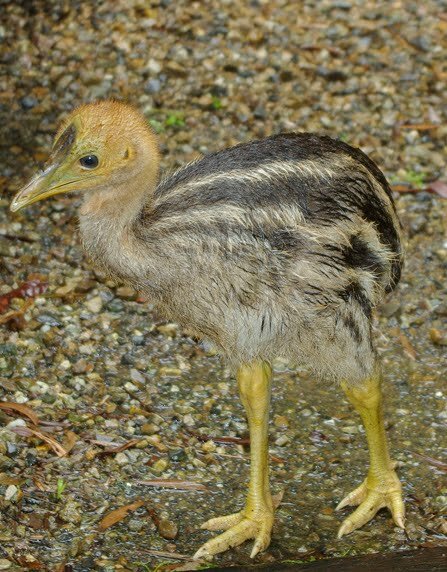 The area has been returned to the rainforest and their crowning accomplishment was the appearance of a Cassowary a few years ago who seemed to approve of the development. In fact, it chased Helen and Tony into the house. I first met Tony in Canberra in the early 1980’s. His personality was such that he was very “people-oriented” and enjoyed talking with anyone who was involved in rainforest or conservation research. Tony was described to me by Ray McInnes as the “gentle giant”. 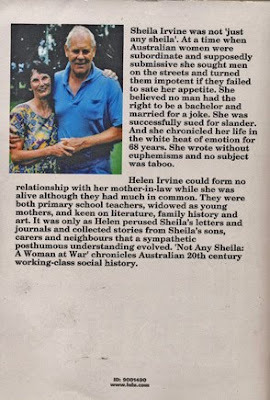 A couple of years before his death, Tony and Helen told me that the latter was writing a book about Tony’s mother who was a most “interesting” person. This was putting it mildly. His mother was a monster. Anthony “Tuppy” Kyle Irvine was born in Melbourne in 1937 and shortly thereafter his father went off to Europe to fight in WW II leaving Tony’s mum, Sheila, to raise him, and later his brother Vivian, alone. As luck would have it, Tony’s father was killed in the war. Tony’s mother never forgave his father for going off to war and felt it was the “easy way out” for him to avoid bringing up his children. She told him repeatedly in letters that she hated him for it and really never liked him in the first place. His father tried to make amends but to no avail. Sheila sometimes forgave him but soon reverted to derision. She was what we would now call a paranoid schizophrenic. Sheila resented having the children and often told both brothers just that. Tony’s brother was given names that could apply to both a male and a female because Sheila did not want to be bothered thinking up names for either a boy or a girl. At other times Sheila seemed compassionate and happy to have the children around. Several times she fobbed them off to agencies in foster care or sent them off to boarding school. The children seemed poorly nourished and often needed medical attention which Sheila could ill afford. Tony had an innate interest in plants and eventually gravitated towards a career in Canberra at CSIRO. As a young man he was an accomplished Australian Rules player with the Ainslie football team. There are award plaques on the wall in the Ainslie Football Club with Tony’s name on them. Late in life Tony suffered from extreme back problems comprising fused vertebrae. He told me he was convinced that this was caused by using telephone poles as a measure of his jumping ability. He would jump for long periods, each time trying to outdo a previous jump. This he thought helped to compress his vertebrae and exacerbate arthritis later in life. I was a guest in Tony’s lab in Atherton for 4 months in 1988. He was a most generous host turning over half of his lab to me for my bottled of living katydids and crickets. I was allowed access after hours to make tape recordings of the sounds produced by the insects. Tony and Don and Judy Fitzsimon often accompanied me on nocturnal fieldtrips in the Atherton vicinity. They were instrumental in my discovering many new species in this group. At her death Tony and Helen set about the task of liquidating Sheila’s assets. This took months. Her house was jammed with goods of all kinds. Sheila was an “accumulator” for lack of a better word, one of those people they have TV series about these days. As an example, Sheila kept all butcher paper—tons of it because “you’ll never know when you need to write a shopping list”. But because of this syndrome, the book was able to be written. Sheila fancied herself a writer and she kept diaries and meticulous notes. It was from all this that Helen was able to piece together Tony’s horrible life as a child. 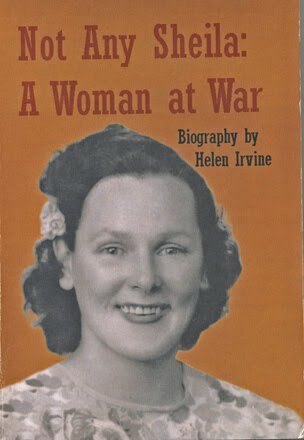 So it was with absolute astonishment to read Helen’s book. She has done a remarkable job of correlating mountains of written material into a very disturbing thought-provoking treatise on schizophrenia, paranoia and child abuse. It is still a wonder to me how such a nice, gracious, hospitable person as Tony Irvine could result from such a horrible upbringing. Tony Irvine had a big following in our area. He was frequently quoted in the newspaper and was often on the local ABC commenting on botanical or environmental matters. His memorial service consisted of a celebration by friends (and there were lots of them) and family followed by a tree-planting in fallow grassland on the border of Lake Barrine. Anyone who knew Tony, or anyone with an interest in child abuse, will find this book interesting, disturbing and thought-provoking. Thanks. Helen. 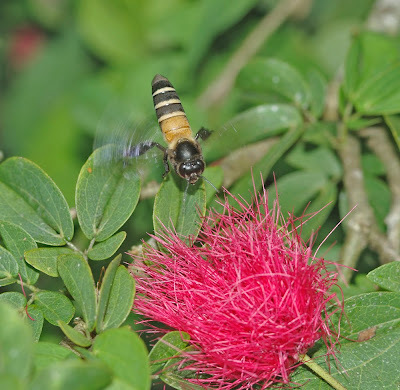 Borneo is the centre of diversity for the genus Apis, the honeybee genus. 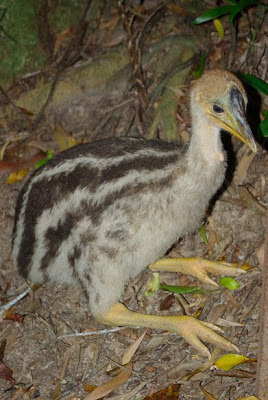 Five species occur on Borneo. There is a wonderful book on the Honeybees of Borneo that should be in the libraries of all beekeepers and entomolgists with an interest in bees. The Honeybees of Borneo documents honeybees in Borneo in a most readable style. I was able to find two Apis species whilst in Borneo recently. Fortunately, one was the Asian Honeybee, the importance of which is noted below. On a related matter, there is currently an entomological emergency of sorts in the Cairns area. 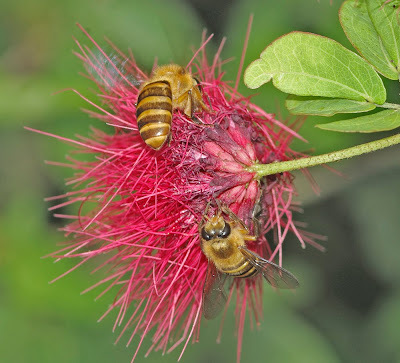 The Asian Honeybee, Apis cerana, was introduced a few years ago, probably as a nest in the mast of a yacht. There are fears that similar introductions could bring the Varroa Mite, a feared destroyer of hives and a major threat to the honey business wherever it occurs. Asian Honeybees have other behavioural characteristics that warrant their control. They are aggressive and rob the hives of the commercial honeybee, Apis mellifera, leaving the hives virtually starved of nutrition. So it was with some consternation that the eradication program for the Asian Honeybee in the Cairns area, as well as the project attempting to eradicate the Electric Ant, Wasmannia auropunctata, was virtually terminated recently when some 40 workers associated with the program were axed. Makes you wonder what there is in the heads of these dollar-crunching administrators. 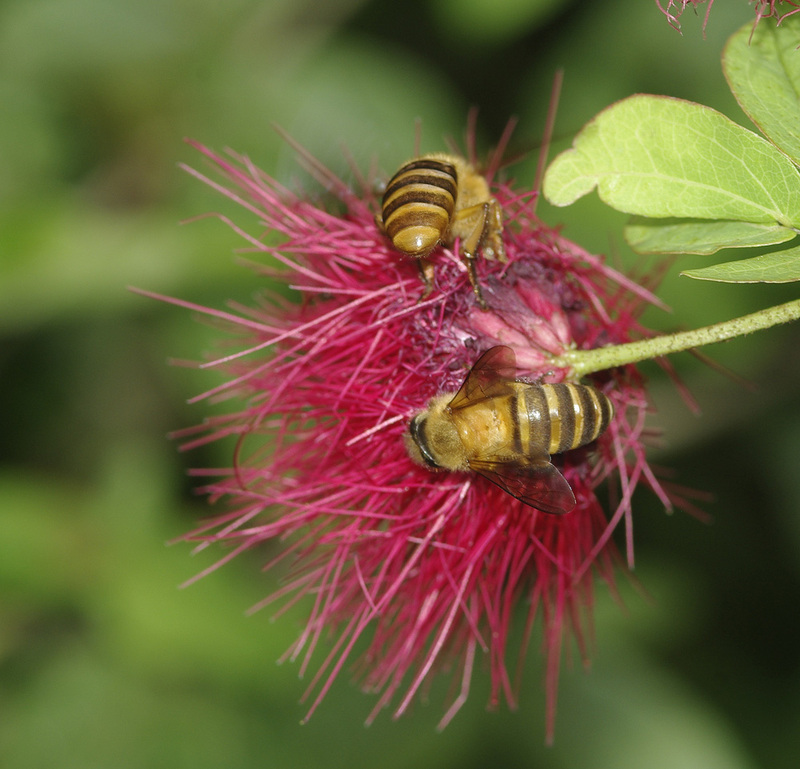 The entire honey and pollination industry in Australia is now under threat. The Giant Honeybee, Apis dorsata, is half again as large as the standard honeybee, Apis mellifera. It has a prominent orange patch dorsally on the first two abdominal segments. Apis dorsata nests high in trees. It is aggressive and very dangerous if provoked. This bee and has never been domesticated but the honey is gathered by native peoples where it occurs. The colony consists of a single vertical comb. The bees adopt a characteristic defensive behaviour known as "defense waving." 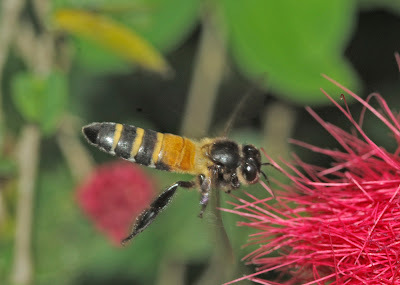 The Asian honeybee, Apis cerana is much smaller than the standard Honeybee, measuring about 10 mm in length. It is much more "nervous", for lack of a better word, than the Honeybee and much more difficult to photograph! The Asian honeybee has much more distinct stripes on the abdomen than the Honeybee. Louse flies are members of the family Hippoboscidae. 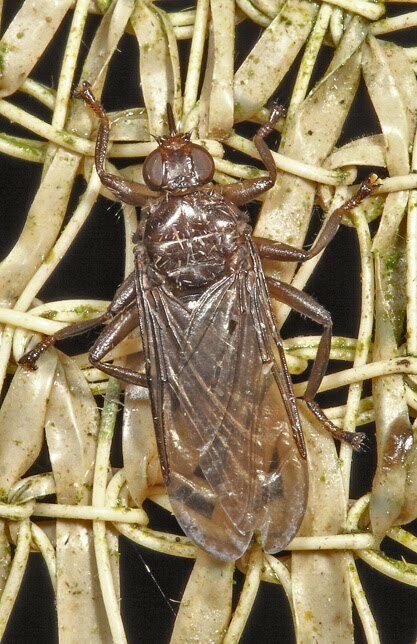 They are dorso-ventrally flattened blood-sucking muscoid flies, the adults of which live as external parasites of birds and mammals. They fossick amongst the hairs or feathers and the flattened body plan aids in this activity. Some have complex life histories involving "adenoptrophic viviparity". This means that eggs are nourished and hatch within the female and living larvae are deposited rather than eggs. 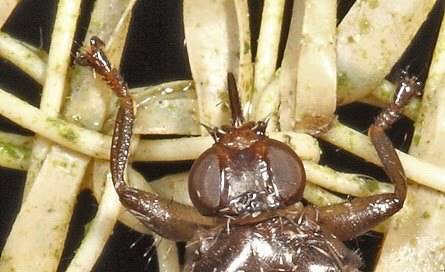 This happens in a number of unrelated flies, the most awful example of which is an Australian brown blowfly. I have often seen hippoboscids scuttling about on the wings and bodies of Brush Turkeys and wondered how to photograph them. To my surpsrise one appeared on the light sheet. A variety of birds and mammals play host to these flies and wallabies have some special ones. I have no idea the host of this fly, but I have myself been mistaken for a host by hippoboscids. They alight and when they discover their mistake are quick retreat. Note the needle-like mouthparts. They use this beak to penetrate the tissues of the host and withdraw blood. There are only a few grasshopper species that could be considered as true rainforest inhabitants in northern Australia. Reasons for this are unclear. 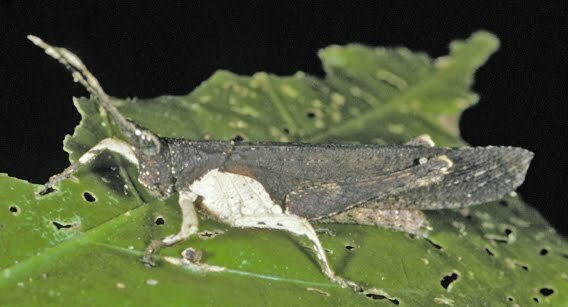 The normally dominant family, the Acrididae, contributes only a single species in the Daintree, Atherton Tablelands and Kuranda rainforests. 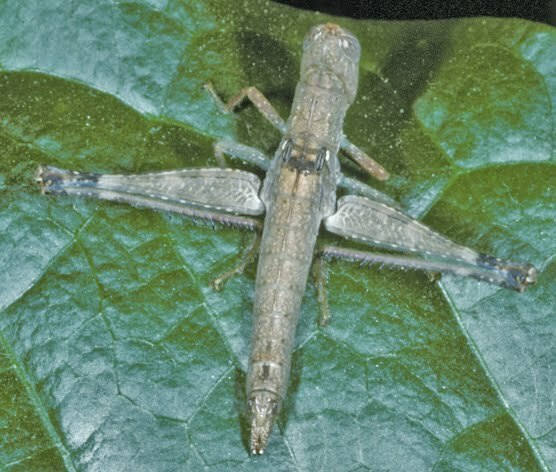 Howwever, there are plenty of acridid species that occupy disturbed areas adjacent to rainforests. These are not dependent on the rainforest habitat but are tropical species that are at home amongst weeds and other plants typical of disturbed or "open" situations. 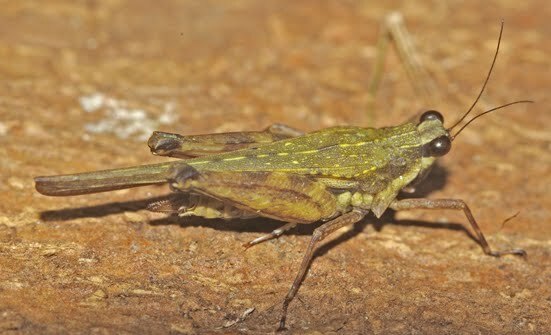 Surprisingly, the dominant family in the rainforests in northeastern Australia is the Tetrigidae, the Pygmy Grasshoppers. This family is the poorest known of Australian grasshoppers. Reasons for this are many but at present, no one is studying this family in Australia. The Eumastacidae, Pyrgomorphidae and the Acrididae each contribute a single species that can be considered as part of the rainforest fauna. The inclusion of the acridid species is a bit marginal as it lives in clearings, feeding on graasses that appear after an opening caused by a tree-fall, landslide or some other disaster. 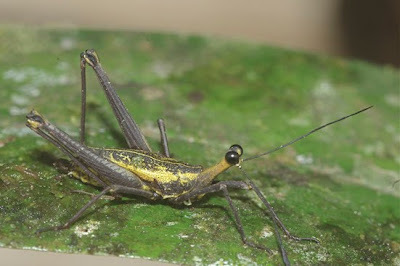 Unlike the other acridid species noted above, these grasshoppers do not stray far from the rainforest. Tetrigid species are notoriously difficult to identify because each species exhibits considerable individual variation. Often you can find several species at a given habitats and there may be forms dimorphic for wing presence, pronotal length etc all occurring together. Australian tetrigids are commonly found along watercourses. They also live in gravel along paths and are frequently found on wet lawns. Many feed on algae and diatoms. This is another tetrgid, genus Loxilobus (subfamiliy Scelimeninae). 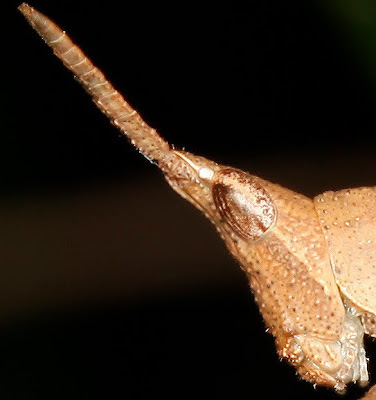 This genus seems characterised by the downwards projecting spine-like appendage that is seen between the fore and middle legs. Although this greenish colour seems distinctive, there is great variation in this and other tetrigids and colour alone is not a reliable character to disitnguish the species. This is a little gem of a tetrigid. It is smaller than most, wingless and characterised by the hood-like projection of the pronotum that extends over the head. This may be an undescribed genus--but one must be careful, there may be a related species in New Guinea that has a generic name. 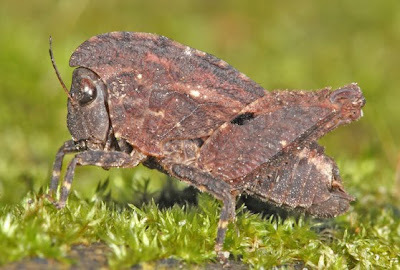 This species lives on bark at the base of large rainforest trees. It may feed on moss. If it's the bizarre that interests you, here is a rainforest tetrigid from the Muller Range in Papua New Guinea. This is a common species where it occurs and is active by day feeding on mosses that grow on leaf surfaces. We don't know its identity. It possesses a combination of bizarre characters, the most obvious of which is the elongated head. There is no similar species in Australia. The Pyrgomorphidae contributes a single genus and species to the Kuranda rainforest. 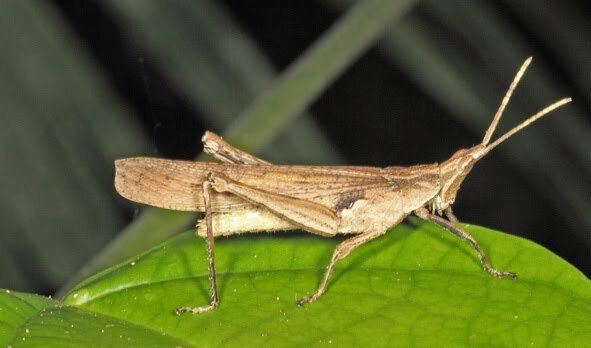 Desmoptera truncatipennis Sjøstedt, The Large Rainforest Pyrgomorph, occupies a narrow range along the coast from the Daintree to the Atherton Tablelands. Its specific name is derived from the truncated or cut-off appearance of the wings. To the north in the rainforests of the Cape, the smaller Desmopterella sp. can be found. 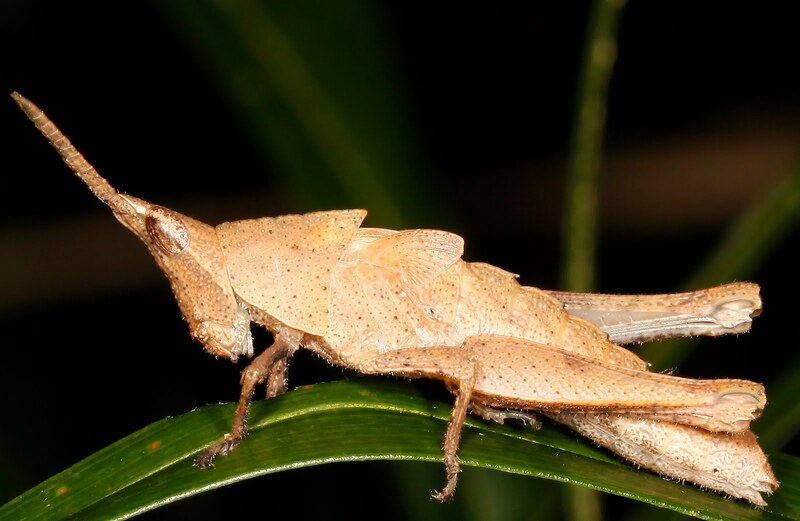 The Large Rainforest Pyrgomorph, male brown morph. This species has a variety of colour forms and, interestingly, none include shades of green. The Large Rainforest Pyrgomorph, male, mottled brown and white morph. D. truncatipennis, The Large Rainforest Pyrgomorph, is easily recognised by its large size and conical head. Nymphs present an unusual appearance with a series of ridges running along the middle of the dorsal part of the insect. 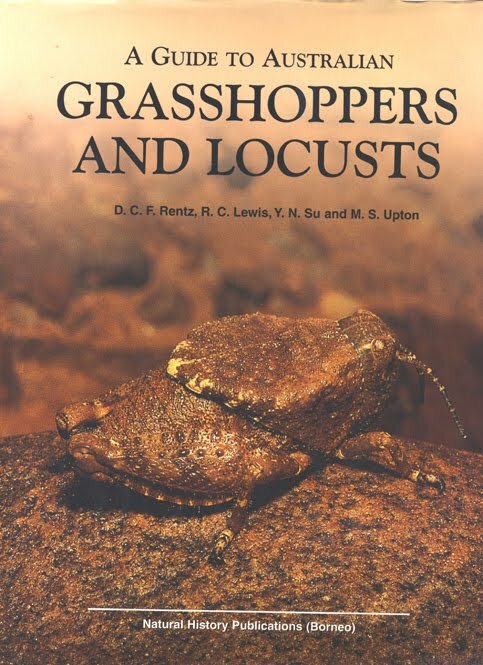 This grasshopper inadvertently avoids the depredations of the Cane Toad, Bufo marinus, by its normal nocturnal activity. 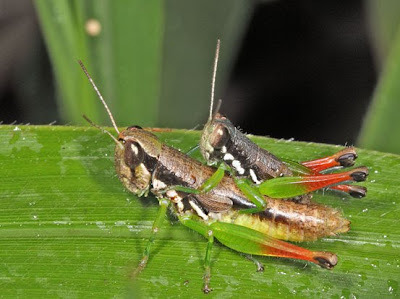 After dark the grasshoppers ascend shrubs and small trees to feed on green leaves. They are, therefore, out of the reach of the cane toads that search the ground for food. 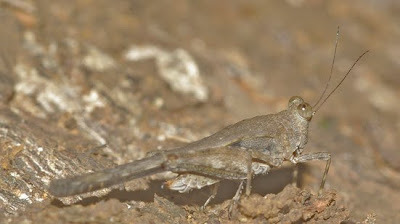 During the day, the grasshoppers live in dry leaf litter, sometimes in close proximity to the toads, but the toads are inactive during the day and the grasshoppers are of no interest. The Eumastacidae are a primarily tropical group occurring worldwide. The notable exception within Australia is the endemic subfamily Morabinae. 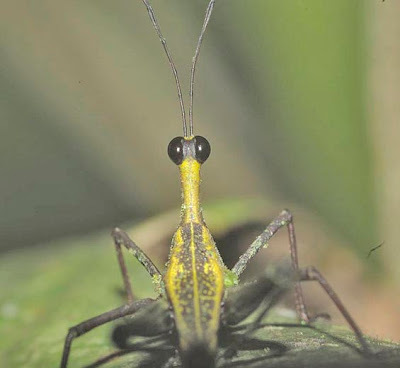 These Matchstick grasshoppers can be found in almost all terrestrial habitats with the exception of the tropical rainforest. However, there is a eumastacid example in tropical rainforests in the form of the genus Biroella. These grasshoppers are poorly collected because they sit on foliage often high in the trees out of reach of entomologists. Many species, like the one shown here, have very short forewings. Collectors often discard them thinking they are immature and not identifiable. The best way of sampling for these species is with canopy fogging techniques. Methiola picta Sjøstedt, the Red-legged Methiola, is the only acridid grasshopper you are likely to encounter in the rainforest proper. It is common in the Daintree, Kuranda and Atherton Tablelands. As noted above, it is a grass feeder. 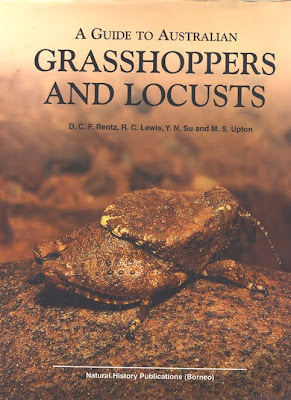 Additional information about Australia Grasshoppers can be found in this guide which is available over the web at Andrew Isles Books. 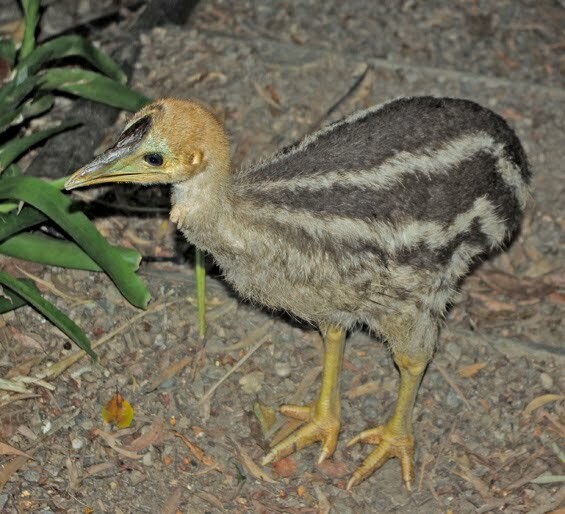 All three Cassowary chicks seem healthy and are growing at this point. There is plenty of food on the ground for them due to the prolonged wet season in the form of fruits and flowers. 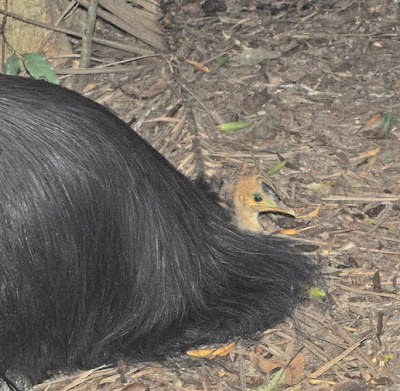 Cassowaries travel many kilometres in a day and it must be tiring for tiny legs. We notice that they frequently relax for 10 minutes or so to digest their food and regain their strength. Then they are off. Taking comfort and rest under "Pops" tail. The young birds frequently climb all over the male during these relaxing periods, much as chicks do in the barnyard with the mother hen.